Eyenavision, Inc. (“Eyenavision”), a company focused on innovative consumer products for the independent optical retailer, announces the release of its Chemistrie™ Frame Line and a stock prescription lens program. 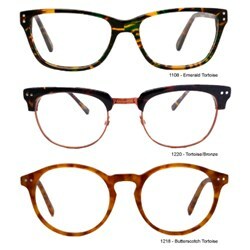 Pictured above are three of the new Chemistrie frame styles. This is our next step in the process of creating additional products that will assist our independent retailer customers to better compete in the optical marketplace. This new Chemistrie frame collection was born with the same vision as the patented Chemistrie Magnetic Lens Layering System; provide a quality product that will enable the independent optical retailer to deliver value to its customers. The Chemistrie frame collection provides popular frame designs, encouraging rapid turnover and strong profits for Eyenavision’s retailer customers. The collection features a modern take on classic designs made up of eight different styles, each available in multiple colors. Additional designs are in production and will be released in early 2014. A point of purchase display is also available for retailers carrying the frames. Information and pricing for these new products is available to existing customers with a login on the Eyenavision ordering website. Information is also available by calling the company at 888-321-3939 or emailing at info(at)eyenavision(dot)com. ABOUT EYENAVISION, INC. – Eyenavision, Inc. is the developer of innovative products for the optical industry. Under the brand name, Chemistrie™, Eyenavision sells its patented Magnetic Lens Layering System series of products that eliminate the challenges typically associated with clip-on eyewear. Eyenavision’s products are sold to consumers at over 2,500 optical retailers nationwide. For more information, visit http://www.eyenavision.com.